Browse through the class list below then schedule a lecture or workshop by Adele Scott for your next event or retreat. Adele's presentations are fun, challenging and fill-up fast. Check out her calendar then reserve you date today with the form at the bottom of the page. 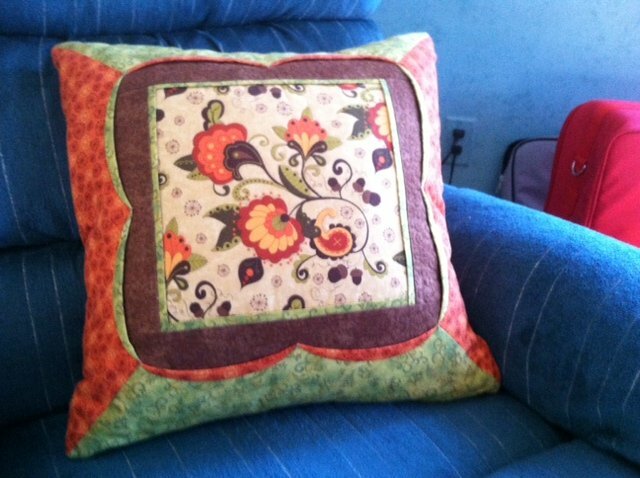 This eye-catching pillow uses techniques that seem like magic for these mitered corners and dramatic scalloped edges. We will also use an easy zipper insertion method and learn how to prevent dog-eared corners. 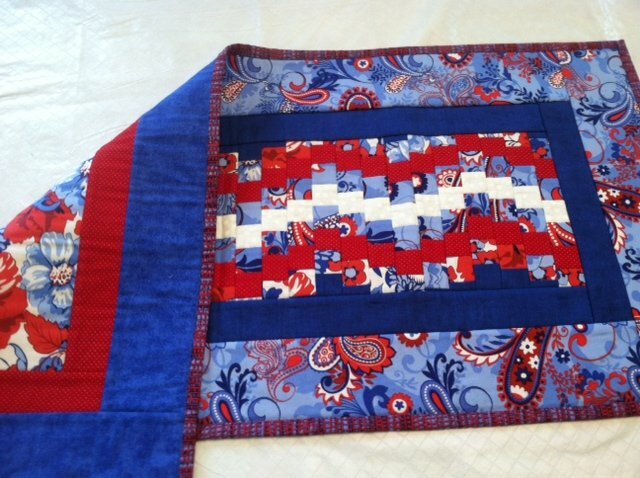 a little machine quilting will add the finishing touch to the "fussy cut" center. Supplies: Sewing Machine with accessories, walking foot, free-motion foot and zipper foot. Border (brown in picture) - 2 strips-5 1/4" x 19" and 2 strips - 5 1/4" x 9"
Back (includes zipper flange) - 18 1/2" x 22"
This traditional block has so many possibilities! Fussy cut centers, multiple squares, snail's trail and more. Emphasis on perfect points. 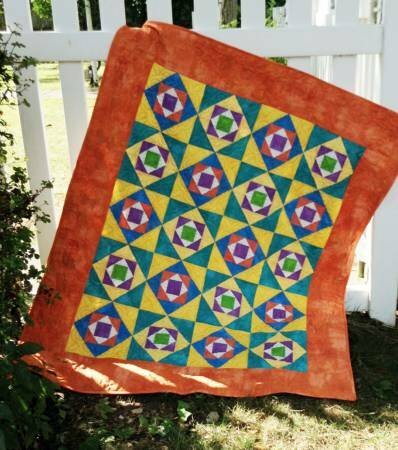 Make a block or two, a runner or a whole quilt. I'll have some specialty rulers to try or bring your own to learn. Supplies: For a 1 block option - cut a 4 1/2" Fussy cut for the center, 2 - 4 1/2" square for the first go-round, 2 - 5 1/2" squares for the final edge. Option 2, cut 1 - 2 1/2" center, 2 - 3" squares, 2 - 3 1/2" squares, 2 - 4 1/2" squares, & 2 - 5 1/2" squares. Also bring general sewing supplies. This class is for machines that have memory capabilities. If your machine has an alphabet it would qualify. We'll learn it's special functions, programming, favorites and all the special thing it can do to help you sew better, faster and easier! Bring your machine and all it's accessories & instruction manual. Assorted thread colors, scissors, a fat quarter of cotton to play. This reversible quilt-as-you-go runner with easy Bargello is the perfect opportunity to make two runners at the same time. Think different holidays or seasons or just being able to turn it over for a change of scenery. Supplies: Fabric - Bargello section - 1/4 yd. of 5 different fabrics, Narrow 1st border - 1/4 yd. for each side, wide outer border - 1/3 yd. for each reversible side, Fusible fleece (Pellon 987F) or thin batting - 3/4 yd., Thread to match, quilt basting spray, rotary cutter and long ruler** e-mail for cutting prep. Applique Options - Techniques, Tools and Threads: This workshop will give you many answers to common applique questions. We will sample and compare various fusible brands, try different weights and types of thread, use other up-to-the-minute products to give you professional results the easy way. Learn how to turn corners, make better curves, and what stitches will work besides regular zigzag. You'll leave with a notebook's worth of information. 6 hours (Fusible Products/Threads 3 hours) (Applique Methods/Techniques 3 hours). Contact Adele Scott and schedule a class, workshop or lecture. Adele teaches both group and individual sessions.